Nowadays, Scooter demands are increasing rapidly because of traffic packed roads and a busy schedule, due to which a large part of society is showing less interest to spend on the bike, a large number of people are showing their interest in having a gearless scooter. Scooter companies are providing more comfort, styling, and performance through new products. People are getting confused to buy the best scooter as there are many types of scooters are available in the automobile market. 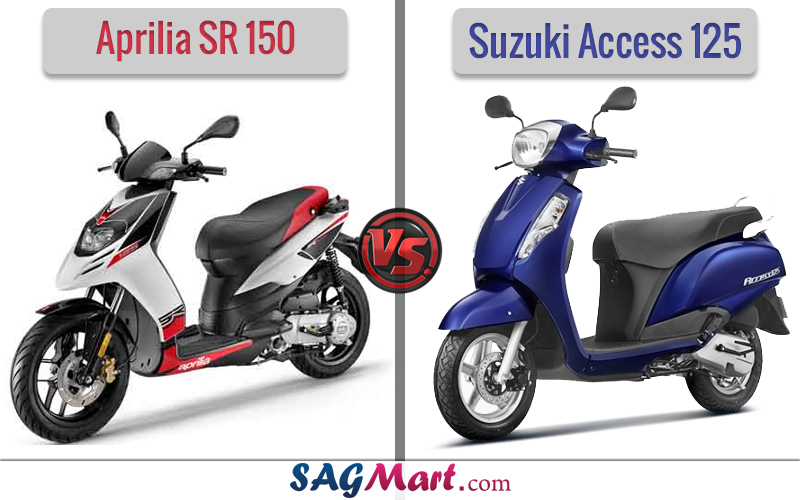 So, here we are comparing two scooters to get an optimum result as per the requirement of any person, one of them is Aprilia SR 150 which is newly launched on 22nd August of 2016 and this scooter have sporty looks which make the scooter a hit among the youngsters and another one is Suzuki Access 125 has launched in march of 2016 and have a unisex design language. Both the scooters are very different to each other. The Aprilia SR 150 is powered by 150cc Air-cooled Engine the least powerful in this segment. The Piaggio company fitted 3 Valve, Aluminium Cylinder Head, Overhead Cam and Roller Rocker Arm, MAP Sensing and Variable Spark Timing Management which generate a maximum power of 11.4 BHP @ 7000 RPM and 11.05 NM @ 5500 RPM of peak torque. The power is transmitted to rear wheels via CVT transmission, which is more than sufficient for a 150cc scooter on Indian roads. While, the Suzuki Access 125 is powered by a 124cc engine displacement with 4-cycle, 1-Cylinder, SOHC and 2 Valve with SEP ( Suzuki Eco Performance) technology. The motor is capable of developing 8.6 BHP @ 7000 RPM of power and delivers 10.2 NM @ 5000 RPM of torque. The figure is decent but still much lower than the Aprilia SR 150. Now if we talk about design and style, Both the scooters different in looks. The Aprilia SR 150 has a European design language which is edgy and contemporary. This scooter will be race decals which we can be seen in most of the Aprilia bikes. This scooter has a sporty look which will make the scooter a hit among the youngsters. Meanwhile, the new Suzuki Access 125 gets decent looks better than the old variant. The fascia is on the curvy side and the chrome around the headlamp gives the scooter a unisex design language. The new Access has been evolved into a royal and cultured look with chrome finish, 3D emblem logo and rich bodywork with stylish edgy contours. For the scooter's safety measures, the company offers Disc brake in the front wheel and drum brake in rear wheel for both scooters. Where Aprilia is featured with SR 150 220 mm Disc brake at the front side and 140 mm Drum brake at the rear side. It keeps Telescopic forks at front suspension and Mono-shock at a rear suspension for smooth riding and the large 14-inch diameter wheels (front and rear) do give the scooter an aggressive stance which should help it stand out from its rivals. 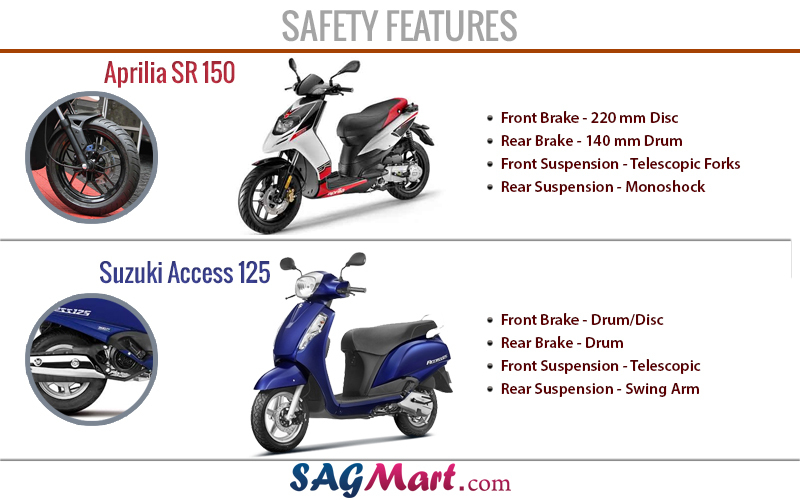 On the other hand, Suzuki Access 125 comes in 2 option Drum and Disc variant. It also keeps telescopic forks at front suspension and Swing arm at rear suspension. The New Access 125 boasts a state of the art of a New frame, optional disc brake and various updates to wheels, suspension, transmission and body panels which provide improved fuel efficiency, performance, cornering stability, smoother ride and added protection model. The Aprilia SR 150 possess a Becky front apron which has the headlight embedded into it while the turn indicators have been placed on the handlebar. The instrument console is rather a simple affair with a twin pod analogue unit for speedometer, fuel gauge, and odometer along with featured tale lights. 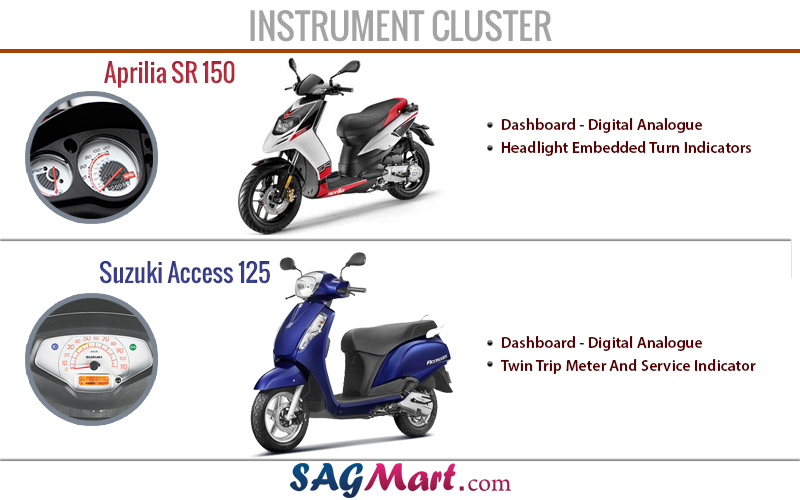 In Suzuki Access 125, the instrument panel has class leading features like the first of its kind Suzuki Easy Start System, multi-function instrument cluster with digital display, front pocket, and optional DC socket. 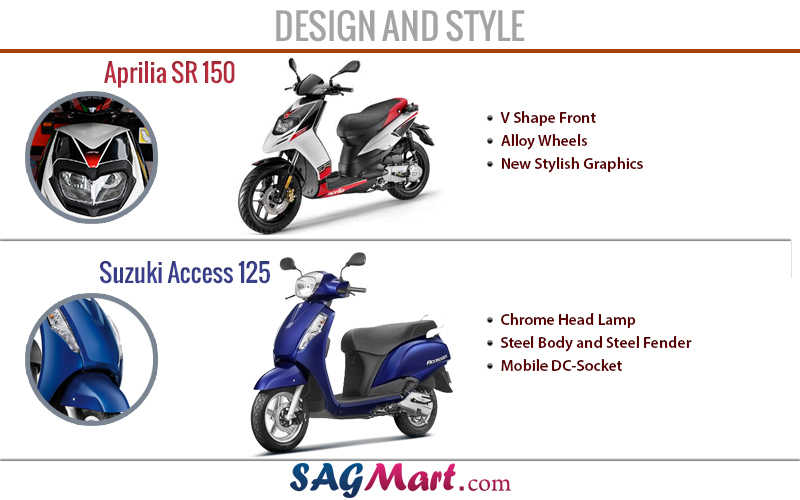 The Aprilia SR 150 is currently available in white and black coloured variant with red graphics which gives a sporty look to the scooter. This scooter returns a claimed fuel efficiency of 55 KMPl mileage on the road. The newly launched scooter is Priced at Rs 65000* (Ex-Showroom Mumbai). The Suzuki Access 125 is available in many colour variants such as Deep Blue, Candy Sonoma Red, Pearl Mirage White, Metallic Matt Fibroin Gray and Glass Sparkle Black, that can be chosen as per the user requirement. The ex-showroom price of the model given by the company is just Rs. 53,887.This scooter returns a claimed fuel efficiency of 64 KMPl mileage on the road.